KABUL, AFGHANISTAN: The Taliban fired a pair of rockets Tuesday toward the presidential palace in Kabul as the Afghan president was delivering his holiday message for the Muslim celebrations of Eid al-Adha, police said, prompting a ferocious aerial response with helicopter gunships bombing the house from where the rockets were reportedly launched. The first rocket landed somewhere near the presidency building while the second hit near a Nato compound and the US Embassy but no one was hurt, said police official Jan Agha. The Kabul area where the rockets hit is one of the most secure in the Afghan capital, where embassies and government buildings are surrounded by high cement blast walls and coils of razor wire. Many streets near the US Embassy are closed off, as well as those near sensitive government and military locations. Eyewitnesses at the scene said that after the explosions, sporadic shooting could be heard from the area, though it wasn’t clear who was firing. The witnesses spoke on condition of anonymity fearing for their safety. There was no immediate statement from the Taliban, or a claim of responsibility for the attack by any other militant group, but the assault on the major Muslim holiday sent a stark message. It was also another blow to Ghani’s efforts to bring the insurgents to the negotiation table and hold peace talks to end the country’s 17-year war. 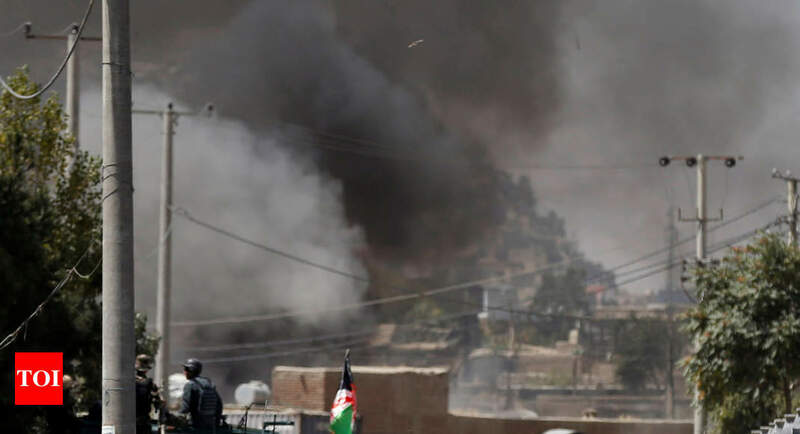 Earlier this month, the insurgents launched a coordinated assault on Ghazni, a strategic city only 120 kilometers (75 miles) from Kabul and the capital of a province with the same name. They seized several neighborhoods, and it took security forces, aided by US airstrikes and advisers, more than five days to drive them out. In neighbouring Pakistan, new prime minister Imran Khan condemned the “cowardly” attack in Kabul. The UN special representative to Afghanistan, Tadamichi Yamamoto, pleaded for peace on the Muslim holiday. Ahead of the Eid al-Adha holiday, Taliban leader Maulvi Haibatullah Akhunzadah released a message on Saturday, saying there would be no peace in Afghanistan as long as the “foreign occupation” continues and reiterated that the group will only negotiate directly with the US, which it blames for the 17-year war. The US and Nato officially ended their combat mission at the end of 2014 but have repeatedly come to the aid of Afghan forces in recent years to prevent the Taliban from advancing into major cities. The Taliban have sent delegations to Uzbekistan and Indonesia in recent weeks, raising their diplomatic profile even while carrying out deadly attacks. The Taliban say they met with a US diplomat in Qatar earlier this month for what the group described as “preliminary” talks, and said it expected further negotiations.